I work at an Elementary School and our theme was “Wild About Reading” so I created a Homemade Handmade Zebra Costume to go with my friend who was a giraffe. I used a zebra mask from an online store, a black wig, zebra eye makeup purchased from a local retailer, black tights, a black long sleeve shirt, zebra print nighty and slippers. 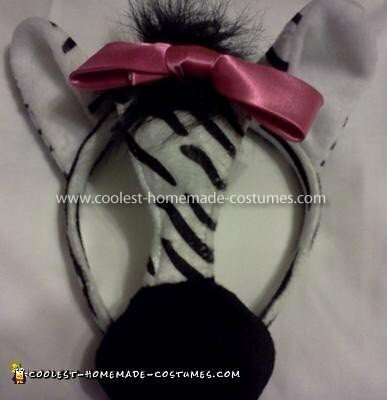 I hot glued a pink ribbon on the mask so it looked more feminine and then used white face paint, silverish pink lipgloss, fake eyelashes and zebra earrings to finish the look.